If you like keeping things simple, then Clearsight 1 Day Contact Lenses by Cooper Vision will suit you best. Lens wear does not get simpler than this. Wear your Clearsight 1 Day Contact Lenses during the day and throw them away at night. You are sure to love the freedom from lens cleaning and storing. These daily disposable lenses also offer you UV protection. If cheap daily disposable lenses are what you are after, then make these contact lenses yours today. 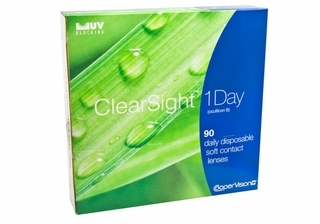 Every box contains 90 daily Clearsight disposable lenses.